Thanks to ride leader Stella for this report. 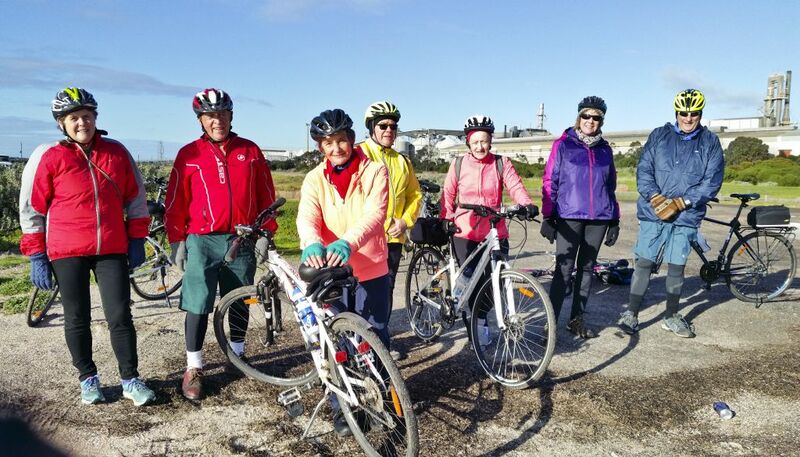 Despite the cold weather 8 riders met at Hearn parade for this Sunday ride – Stella (ride leader), Rod, Rosemary, Michael, Chris, Sandra and Paul. There was no rain around and clear sky so off we went and soon warmed up. The route went along the new cycling path in Eastern Park, which starts at the end of Malop Street and ends (far too soon ) at the traffic lights by the Animal Research traffic lights – Boundary Road. It’s very smooth and very nice to ride through the park this way. Try it if you haven’t been! Then on to Alcoa and Point Henry via Portarlington Road. This is an interesting part of Geelong due to all the changes that are happening to Alcoa and we all had ideas about how to develop the area! There are lovely views of Geelong from this peaceful and quiet place. The return trip was via the Bellarine Rail Trail, Boundary road and then through the park again. 25 km all round. Coffee at Winifreds were we had delicious drinks and a warm welcome from the Owners! It was good to see Heather there. Editor’s note: Winifreds is well worth a visit. However, don’t expect to speak to Winifred. The owner’s name is Georgia. Winifred was a much loved dog. This entry was posted in Ride reports and tagged Alcoa, Point Henry, Winifreds Cafe by hlyth2013. Bookmark the permalink.